Recent years have seen an alarming increase in the closure of churches resulting in organs being available for disposal. The advent of the electronic organ as a viable replacement has also often resulted in the explusion of many organs from churches. Northern Ireland and the Republic of Ireland are to a greater extent isolated from such preservation companies as the Organ Clearing House (USA) and the Redundant Organ Rehousing Co Ltd (Great Britian). Redundant pipe organs on this island have often been subject to scrapping and only the occasional relocation. Alistair G McCartney BSc MISOB and Adrian R McLaughlin BTh MTh formed the Pipe Organ Preservation Co. (of Ireland) in 1999 to address these problems and hopefully preserve heritage which would otherwise be lost, and in doing so help to provide congregations or individuals with an instrument which could not be afforded if new. Saving and preserving organs is only a small part of our work and as professional organ builders we are constantly involved in all aspects of organ building including tuning, repairs, design and major work. Maintain a list to identify instruments available for rehousing. Find possible new homes for instruments either by advertising or being contacted directly by potential customers. Discourage custodians of instruments from destroying them or selling them for scrap. Offer storage (as a last resort) for threatened instruments. In which case worthwhile instruments are rescued and stored until a new home can be found. A nominal fixed fee may be charged for the successful rehousing of an instrument when the POPCo is involved in locating it for another firm to complete the work. 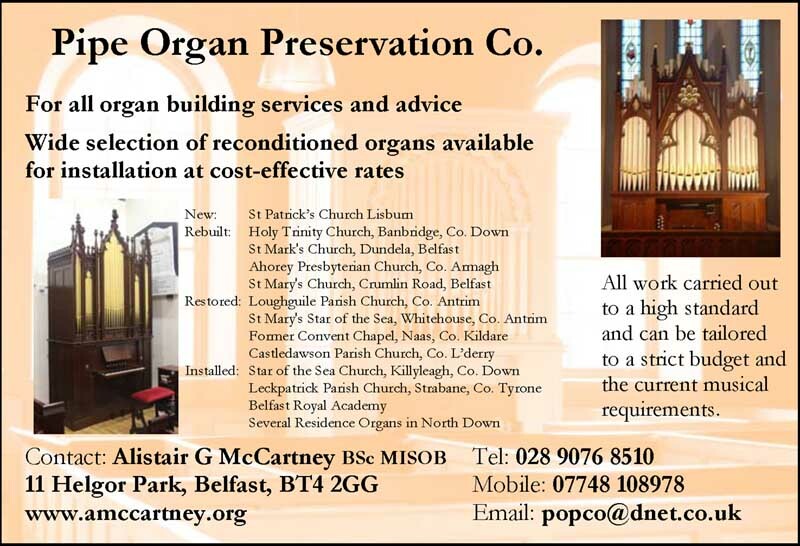 A comprehensive organ building service of tuning, maintenance, rebuild, restoration, new organs and consultancy is offered by the Pipe Organ Preservation Co. throughout Northern Ireland, Republic of Ireland and further afield. St Patrick's RC Church Lisburn Co.Antrim is our largest project to date and is essentially a new instrument built retaining only the casework and 5 ranks from the previous Evans & Barr instrument. It was enlarged from 15 to 45 stops incorporating pipes from another organ by the same builder together with a new 3 manual console with 62 drawstops. A public concert for the opening was given on 21 November 2014 by Jean-Paul Lecot. Two church organs displaced by their buildings having to be demolished were relocated late summer 2013. The Evans & Barr ideal organ from c1928 was moved from Maze Presbyterian to Ardtrea Parish Church near Cookstown, this being its fourth home having started in 2nd Killyleagh. The Star of the Sea church next door in Killyleagh received a 2 manual & pedal 8 stop tracker by Wells-Kennedy 1988 from Harryville in Ballymena. All Saints' Church Loughguile near Ballymoney Co.Antrim in 2013 had installed a small tracker organ identical to its neighbouring parish Armoy. The organ dating from 1870 required full restoration having narrowly escaped total destruction in a fire. Diamond Grange Parish Church near Portadown Co.Armagh was restored in 2012. A 6 stop Evans & Barr ideal organ from 1937 perfectly suited to this small country church. Tubular-pneumatic action being fully restored throughout with no alterations. Bailieborough Parish Church Co. Cavan has had a new organ case installed using a quality Evans & Barr case modified and extended to suit in 2011. Other alterations and refinements are being undertaken to the organ itself. A historic chamber organ was restored for Castledawson Parish Church, Co. Londonderry in 2011. New organ case for St Gall's Parish Church, Carnalea Bangor Co. Down was designed, constructed and installed in 2011. St Paul's Parish Church, York Street, Belfast had some revoicing with balances between ranks having to be drastically altered to make all stops integrate and various ranks rescaled to remove the overall hard stringy tone of the organ. St Brendan's Parish Church, Sydenham, Belfast is currently having the Great organ rebuilt and connected. This has been prepared for since the organ was built 43 years previously in 1968. A delightful Bevington organ from 1863 in a former Convent Chapel in Naas Co. Kildare was restored in 2010/11 on historic principles and the mechanical action was recreated having been discarded several decades ago when it was unfortunately electrified. 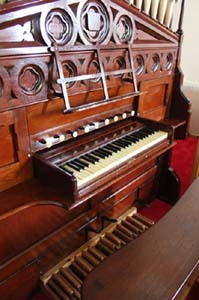 In 2010 Knockbride Parish Church Co. Cavan had installed an organ to replace an aged harmonium. This 'Ideal' model by Evans & Barr was restored including all the pneumatic action. In 2009 Ahorey Presbyterian Church Co. Armagh had installed a rebuilt Walker extension organ from a closed church in Londonderry and this was enhanced with some Compton parts from their previous instrument. 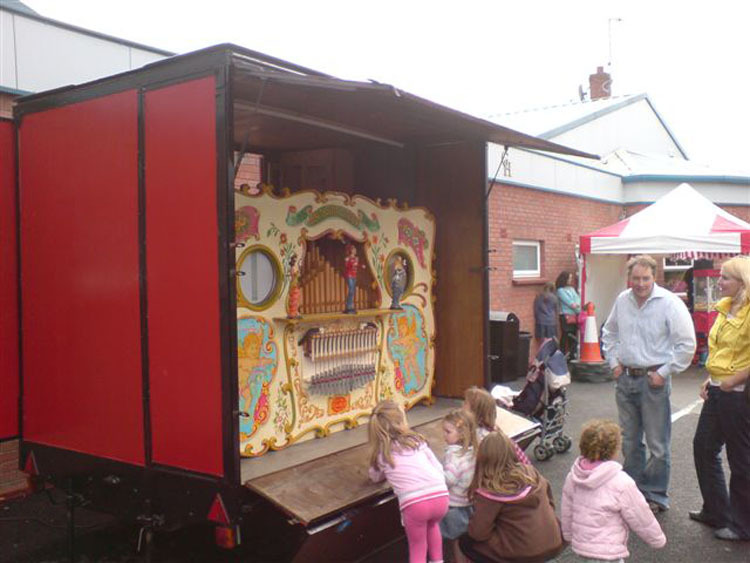 Armoy Parish Church Co. Antrim were able to successfully rehouse a typical Victorian village church organ in 2009. Two house organs were installed in residences in the North Down area for two organists. To make the 1892 Conacher organ in All Saints' Parish Church Antrim more effective in the building, additional and replacement stops were fitted in 2008/9. The 3 manual 1883 Conacher organ in Holy Trinity Church, Seapatrick Parish, Banbridge was revoiced and the electrics were upgraded together with a new Great soundboard in 2007. A high pressure Tuba was also installed at the west end of the building. 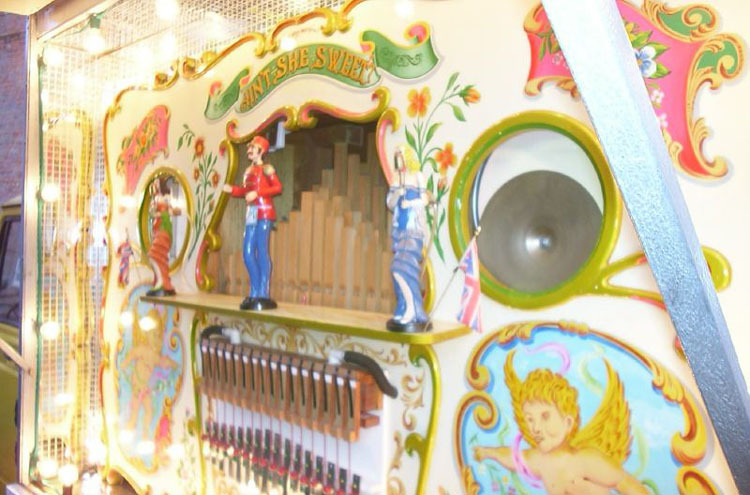 A curious but effective and reliable 1960s extension organ by the Solway Organs of Wigtownshire was overhauled and installed in Ballyclog Parish Church Co. Tyrone in 2007. The organ in St Mary's Crumlin Road Belfast was in need of refurbishment and the Great department has been redesigned with a new slider soundboard and Victorian casework to replace a 1960s functional display. An organ built by Telford for a convent in Navan and enlarged to 2 manuals by Kenneth Jones for its installation in Delvin Co. Westmeath in 1980 was refurbished and installed in the assembly hall of Belfast Royal Academy in 2005. The 4 manual 10(12) rank Compton organ in St Mark's Church of Ireland, Dundela, Belfast was fully restored and slightly enhanced. A 5 stop chamber organ mainly dating from the 1871 Walker rebuild but containing earlier parts was acquired from a church in Wales who needed the space for disabled access. After a period of months serving as a temporary organ in Donaghadee Parish Church Co. Down and subsequently St Mary's Star of the Sea, Whitehouse, Co.Antrim, it was fully restored and installed in Leckpatrick Church of Ireland, Strabane, Co.Tyrone in 2004. The 1932 Hart & Churchill organ in St Mary's Star of the Sea, Whitehouse, Co. Antrim was in poor condition when we first saw it. The building has just been refurbished and the organ was covered in dust. After restoration in 2003 and enhancement of the case decoration it is a good working example of what must be one of the last tracker organs to be built pre Organ Reform Movement. An mid 19th Century chamber organ from Portreath Methodist Church, Cornwall became redundant when the church closed and was purchased and subsequently removed by us to Belfast. 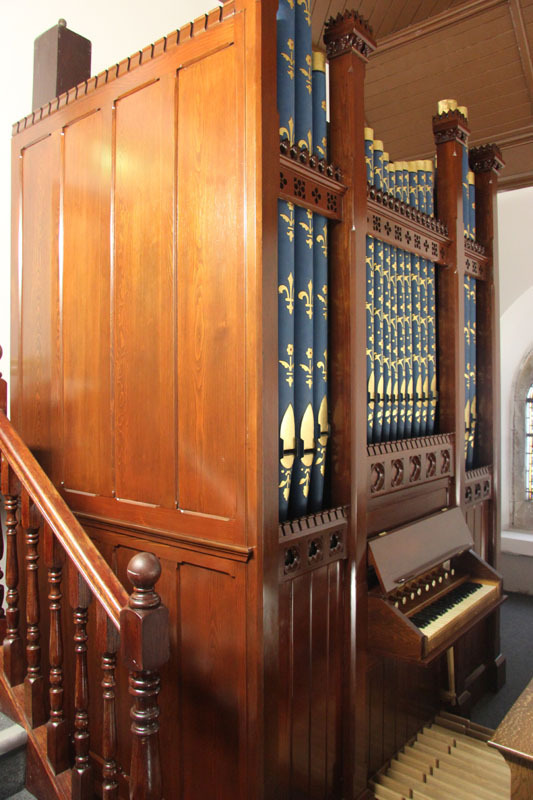 After a period of months serving as a temporary organ in All Souls' Church, Elmwood Avenue, Belfast, it was installed in St Mullin's Church of Ireland, Timolin, Co.Kildare. This mid 19th Century church never had an organ and the only suitable place was on the west gallery where there was only less than 10 feet height available. The organ from Portreath fitted perfectly and was restored and installed in late summer 2002. The 1860 Walker organ from Woodstock Road Baptist Church, Oxford became redundant in 2000 and was purchased and subsequently removed by us to Belfast. It was thoroughly overhauled and the case restored to its original dimensions & colour. 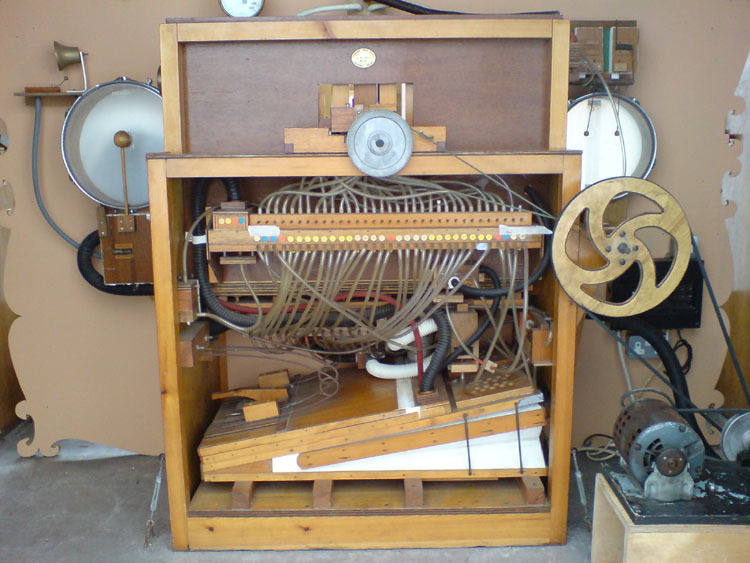 A home was found in St Canice's Church of Ireland, Finglas, Dublin where it replaced collection of recycled organ parts which formed an unbelievable & unreliable instrument. Installation of the restored Walker organ took place in late summer 2001 and has proved to be an ideal and highly thought of replacement. After rescuing the historic Robson organ originally in Christ Church, College Square North, Belfast from being destroyed, we found it a home in the splendid surroundings of the Great Hall at Queen's University Belfast. The organ has now been fully restored to its original specification by William Drake and now sits on a newly created gallery as the focal point of the recently refurbished hall. We were contacted by Comber Non-Subscribing Presbyterian Church Co. Down regarding a pipe organ to replace their aging electronic. A suitable pipe organ was found in England and was subsequently restored and installed by us in the church at minimal cost. © Pipe Organ Preservation Co., Belfast, Northern Ireland.